A coin is usually a piece of hard material, generally metal, usually in the shape of a disc, and most often issued by a government, to be used as a form of money in transactions. Along with banknotes, coins make up the cash forms of all modern money systems. Coins are usually used for lower-valued units, and banknotes are usually used for the higher values; also, in most money systems, the highest value coin is worth less than the lowest-value note. See Coin collecting and Numismatics for more information on the collecting of coins, bank notes, token coins and Exonumia. The market exchange value of a coin comes from its historic value, and/or the intrinsic value of the component metal (for example gold coins, silver coins or platinum coins). However, in modern times, most coins are made of a base metal and their value comes strictly from their status as fiat money. This means that the value of the coin is decreed by government fiat rather than agreed by the people, which really makes it less a coin and more a token in the strictest sense. It must be made of a valuable material, and trade for close to the market value of that material. It must be of a standardized weight and purity. It must be marked to identify the authority that guarantees the content. 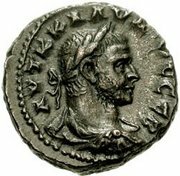 By the above definition, the invention and first known usage of coins comes from the Kingdom of Lydia circa 643-630 B.C. Under three generations of Lydian kings, the money of Lydia gradually moved from being lumps of electrum (a naturally occurring alloy of silver and gold) to coins of a guaranteed weight and purity, marked with the seal of the King. True coins also developed very close to this time frame in both India and China. In 1979 and 1980, a Chinese architectural team excavating the region surrounding the ancient kingdom of Loulan discovered some Mesolithic stone tools and coins (see Loulan: Modern Chinese Expeditions). Throughout history, governments have been known to create more coinage than their supply of precious metals would allow. By replacing some fraction of a coin's precious metal content with a base metal (often copper or nickel), the intrinsic value of each individual coin was reduced (thereby "debasing" their money), allowing the coining authority to produce more coins than would otherwise be possible. Debasement of money almost always leads to price inflation unless price controls are also instituted by the governing authority. Some consider a classic example of this phenomenon to be the behaviour of price levels in the United States since 1964 (the last year circulating United States Coins were minted of 90 percent silver). Such debasement and inflation were not unique to the U.S. Virtually every other country debased their coinage too. The United Kingdom and other countries saw similar inflation during the same era. Furthermore, the silver coinage current in the first half of the 20th century was not necessarily "true coinage" by the definition above. For example, in 1960, the silver in a U.S. dime was worth less than four cents. Many countries have redenominated their currency as a means of making a currency system impacted by inflation more practical. A recent, but extreme example of this is Turkey, which redenominated its currency on January 1st, 2005. One new Turkish Lira is worth one million of the old Turkish Lira. 1) Reducing the size of the coins or using cheaper metals, such as New Zealand's change from copper-nickel coins to smaller, plated coins. 2) Removing lower-valued coins from circulation. New Zealand has removed its one, two and five cent coins from circulation. Many other countries, including Australia and the United Kingdom, have also taken a similar approach. 3) Replacing low-value banknotes with coins. The United Kingdom has one- and two-pound coins, and New Zealand has one- and two-dollar coins. This is generally driven by economic factors, as coins last substantially longer than banknotes. The United States is unusual in that it has only slightly modified its coinage system to accommodate this inflation. The one-cent coin has changed little since 1864 (though its composition was changed in 1982 to remove virtually all copper from the coin) and still remains in circulation, despite a greatly reduced purchasing power. On the other end of the spectrum, the largest coin in common circulation is 25 cents, a low value for the largest denomination coin compared to other countries. Attempts at introducing a one-dollar coin have met with limited success. As a result, coins in America today are scarcely regarded as "money" in any practical sense. Increasingly common are coin-counting machines which charge money to consumers for converting their "coins" into "cash". Interestingly, with the recent dramatic increases in the prices of copper, nickel, and zinc, both the US one- and five-cent coins are now worth more for their raw metal content than their face value. In particular, copper one-cent pieces (those dated prior to 1982 and some 1982-dated coins) now contain about two cents' worth of copper. 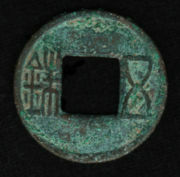 A bronze coin of the Chinese Han Dynasty—circa 1st century BC. Some modern Japanese coins still have the characteristic hole in the coin. An ancient Greek coin, struck under Roman rule, circa 268 AD. The milled, or reeded, edges still found on many coins were originally designed to show that none of the valuable metal had been shaved off the coin. Prior to the use of milled edges, circulating coins commonly suffered from "shaving", by which unscrupulous persons would shave a small amount of precious metal from the edge. Unmilled British sterling silver coins were known to be shaved to almost half of their minted weight. This form of debasement in Tudor England led to the formulation of Gresham's Law. The monarch would have to periodically recall circulating coins, paying only bullion value of the silver, and re-mint them. Traditionally, the side of a coin carrying a bust of a monarch or other authority, or a national emblem, is called the obverse, or colloquially, heads. The other side is called the reverse, or colloquially, tails. However, the rule is violated in some cases. Another rule is that the side carrying the year of minting is the obverse, although some Chinese coins, most Canadian coins, the British 20p coin, and all Japanese coins, are an exception. The orientation of the obverse with respect to the reverse differs between countries. Some coins have coin orientation, where the coin must be flipped vertically to see the other side; other coins, such as British coins, have medallic orientation, where the coin must be flipped horizontally to see the other side. Coins that are not round (British 50 pence for example) usually have an odd number of sides, with the edges rounded off. This is so that the coin has a constant diameter, and will therefore be recognised by vending machines whichever way it is inserted. If a coin had an even number of sides this would not be possible. Some such older designs remain, however, such as the 12-sided Australian 50 cent coin. Coins are popularly used as a sort of two-sided die; in order to choose between two options with a random possibility, one choice will be labeled "heads" and the other "tails," and a coin will be flipped or "tossed" to see whether the heads or tails side comes up on top. See Bernoulli trial; a fair coin is defined to have the probability of heads (in the parlance of Bernoulli trials, a "success") of exactly 0.5. A widely publicized example of an asymmetrical coin is the Belgian one euro coin . See also coin flipping. 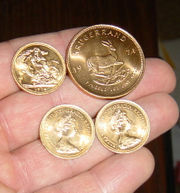 Coins are sometimes falsified to make one side weigh more. Such a coin is said to be "weighted." Some coins, called bracteates, are so thin they can only be struck on one side. Bi-metallic coins are sometimes used for commemorative purposes, and in the 1990s, France used a tri-metallic coin. In 1996 Canada adopted a bi-metallic two dollar coin commonly referred to as the toonie. Guitar-shaped coins were once issued in Somalia, Poland once issued a fan-shaped 10 zloty coin, but perhaps the oddest coin ever was the 2002 $10 coin from Nauru, a Europe-shaped coin.